"Comes in four different sizes, each one with a strong vinyl flap that features a magnetic enclosure to secure the entryway." "Uses a lithium battery-operated collar to trigger the door and let your dog out when he’s ready to do his business." "Available in heights of either 81” or 96” height and four width options from small to x-large, depending on the size of your pup." "Features a double flap design for maximum energy efficiency and a magnetic closure to keep the entryway closed when in use." "The extra-large is perfect if your dog is more “bear” than “bunny.” It fits dogs up to 220 pounds, 13” wide and 23” in height." "Ideal for teacup and miniature pups." "It’s the perfect solution for hot days when you want to keep the door open without inviting bugs into your home." The PetSafe Freedom Aluminum Pet Door is a great choice for most families (and most dogs). This durable dog door works for exterior doors up to two inches thick​ and is made from durable plastic with a heavy-duty aluminum lining to keep bad weather out. Plus, the door is strong enough to keep other pets, such as too-smart cats, away. The door comes in four different sizes, each one with a strong vinyl flap that features a magnetic enclosure to secure the entryway. 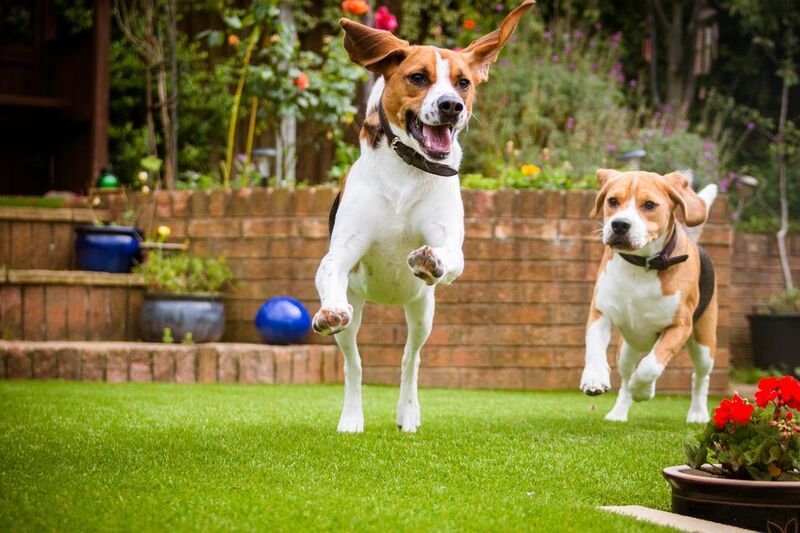 The small size works well for dogs up to 15 pounds, while the x-large is perfect for dogs up to 220 pounds. Before you buy, measure your pup’s shoulder length to ensure an exact fit. This PetSafe door comes with detailed instructions so you can install it yourself, but the company offers a customer service line to answer any questions you may have during the process. Though all dog doors do their very best to keep unwanted pests out, the High Tech Pet Electronic Door is by far the best choice if you’re worried about unwanted animal friends dropping by for a visit. This sensor-triggered dog door uses a lithium battery-operated collar to trigger the door and let your dog out when he’s ready to do his business. The directional operation is created to open only when your dog is directly approaching the door, not when he is sleeping or nosing around nearby. The door measures 12” x 16” and works for dogs up to 100 pounds. The four-way access control allows you to switch modes from in-only, out-only, both ways or fully locked as needed. Though this electronic dog door has a higher price tag than the standard doors on our list, owners say it’s easy to install and well worth the cost for the security it offers. 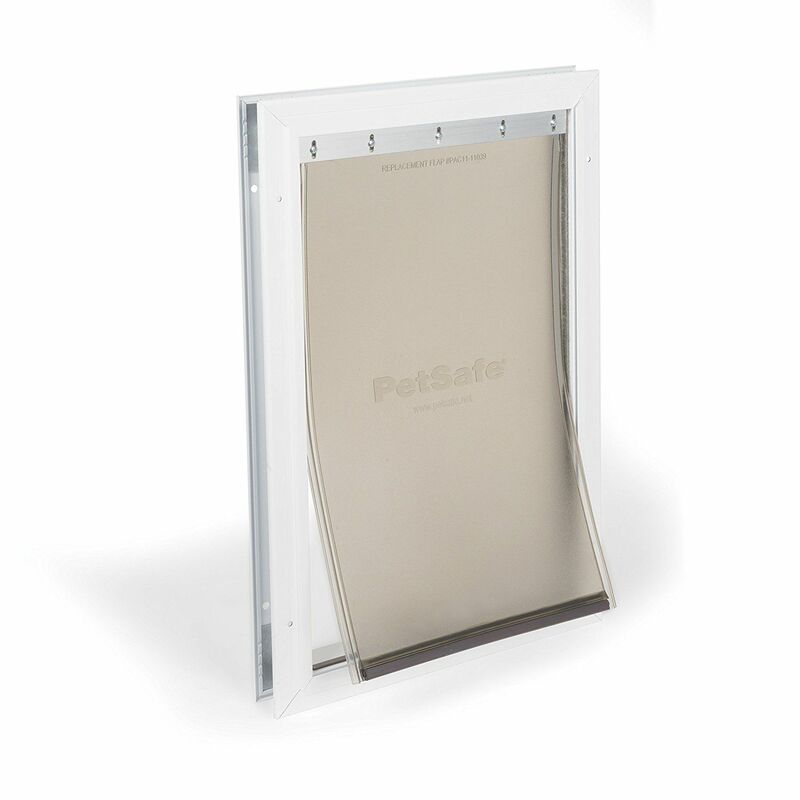 If you don’t want to pick up a drill or a saw, the PetSafe Freedom Aluminum Patio Panel Sliding Dog Door is for you. This easy-to-install product is made for sliding glass doors and works by fitting into the existing track. The door is available in heights of either 81” or 96” height and four width options from small to x-large, depending on the size of your pup. You can also pick from white, satin or bronze, so the dog door blends in with the rest. Meanwhile, the aluminum frame and weather stripping do a good job of keeping bad weather out. One of the biggest concerns for pet owners when considering a dog door is whether cold air will seep inside, especially during the harsh winter months. The Ideal Pet Ruff Weather Framed Pet Door is a great choice for colder climates and harsh conditions. This dog door is installed in a wall rather than an exterior door, and comes with detailed instructions so you can find the very best wall space for your door. This dog door features a double flap design for maximum energy efficiency and a magnetic closure to keep the entryway closed when in use. It’s 15” by 23.5” and fits dogs up to 150 pounds. Even though a wall-installed door may sound intimidating, reviewers say the instructions are easy to follow, even for the non-handyman. Dog lovers say the Ideal Pet Ruff Weather Door is perfect for all temperatures and works for dogs of all sizes. The PetSafe Plastic Pet Door comes in a wide variety of sizes, but the extra-large is perfect if your dog is more “bear” than “bunny.” It fits dogs up to 220 pounds, 13” wide and 23” in height. This simple dog door features a durable plastic frame that can be installed in doors up to 2” thick. This moderate-use door is ideal for single pet homes. The white frame is easily paintable so you can match it to your door. The snap closure allows you to secure the door when you don't want your dog using it. PetSafe owners say this dog door is easy to install—and though it’s more lightweight than some of the other options on our list, it’s effective at keeping Fido’s other animal friends out. Smaller dogs often can’t hold their bladders as long as their larger counterparts, and a dog door can be a lifesaver for those long days. The Dog Mate Small Dog Door is perfect for dogs up to 14 inches in height. This plastic door offers a four-way locking system with a brush sealed, draft-proof flap. Ideal for teacup and miniature pups, the Dog Mate Small Dog Door is not only a breeze to install, but it's also weatherproof. The Apalus Magnetic Screen Door is an installation-free alternative to a traditional dog door. This screen flap is perfect for those summer nights when you entertain friends but want to give your pup the freedom to come and go as he pleases. This screen is 36” by 83” and closes via extra-strength magnets. It’s the perfect solution for hot days when you want to keep the door open without inviting bugs into your home. The Apalus Magnetic Screen Door is not specifically made for dogs, but owners say it’s a wonderful dog door. The screen closes automatically and it won’t tear when your dog bumbles through it.